The discovery, reported Wednesday in the journal Nature is not so much a surprise as a triumph of science and engineering. The research team spent 10 years and more than $10 million to prove beyond a shadow of a doubt that life did indeed exist in subglacial lakes near the South Pole. John Priscu, the lead scientist on the project, has been studying the Antarctic for 30 years. He published his first paper describing how life might exist in the extreme environment beneath the ice sheet in 1999, and has been looking for definitive proof ever since. In the winter of 2013-2014, he finally got his chance. After spending millions on a drill that could bore a clean hole free of contaminants through the ice sheet, and moving more than 1 million pounds of gear on giant sleds across the Antarctic ice sheet, he and his team had just four frenzied days to collect the water samples that would prove whether his theories were right or wrong. Before claiming victory, he wanted to see three lines of evidence that life did exist in the underwater lake. He wanted to visually see the cells under a microscope, he wanted to prove they were alive by feeding them organic matter and measuring their respiration rate, and he wanted to see how much ATT was in their cells. Priscu and his team report the discovery of close to 4,000 species of microbes growing in the cold, dark environment of Subglacial Lake Whillans in western Antarctica. Each quarter teaspoon of the tea-colored lake water that they brought to the surface had about 130,000 cells in it, they write. Life in the lakes of Louisiana has sunlight to provide it with energy, but in the lightless environment of Subglacial Lake Whillans, the microbes rely on minerals from the bedrock and sediments instead. The pressure of the slowly moving ice above the lake grinds the underlying rock into a powder, liberating the minerals in the rock into the water, and making them accessible to the microorganisms living there, explains Christener. The microbes act on those iron, ammonium and sulphide compounds to create energy. “Ice, water and rock is all that is really needed to fuel the system,” he said. The findings have major implications for the search for life outside of Earth, especially on the moons of Enceladus and Europa, where scientists believe a thick icy crust covers a vast, internal liquid ocean. Lake Whillans, the first lake to be sampled in Antarctica, is a shallow lake, about 6 feet deep, and about 37-square-miles in size. Priscu compares it to the lakes you might see in the Mississippi Basin, with rivers running through it and bringing some of the lake water out into the Indian Ocean. To sample it, the researchers developed a new type of hot water drill system. The tricky part was using the hot water to drill down into the ice without getting any of that water in the lake. “It’s like taking an 800 page novel and drilling down into 799 pages and then stopping,” he said. The researchers brought about 13 gallons of the lake water back to the surface to study its chemistry and to see what might be living in it. The water was a brownish color because of the very fine particles that were suspended in it. The particles were so fine, that even after a few days, they did not settle to the bottom of the containers. Going forward, the researchers want to learn more about how nutrients created by microbial activity in Lake Whillans affects the water in the Indian Ocean. They also think there may be large amounts of the greenhouse gas methane being produced in the lake that could be released into the atmosphere if the Antarctic ice sheet melts. They would also like to look at other types of subglacial lakes on the continent, some of which are 3,000 feet deep and buried beneath 2 miles of ice. “Now that we have shown that life can exist in this environment, we’d like to look at other lake types to see the biodiversity and ecosystems that exist under the ice, and get a better idea of their global importance,” said Priscu, who was on his way to plan the next expedition. The team is going back to Antarctica with their drill in November. “Hopefully we’ll have more discoveries coming soon,” he said. For more news on amazing science, follow me @DeborahNetburn and “like” Los Angeles Times Science Health on Facebook. Who Owns the Ocean Floor? That cell phone you carry. It’s made from copper, gold, lead, nickel, zinc and a plethora of less known, hard-to-pronounce metals, not to mention the mined materials needed for the battery that powers the device. Same goes for your computer and other electronics you use on a daily basis. The ocean floor teems with metal (at least in spots we’ve targeted so far): copper and nickel, cobalt and silver, even gold. Many consider it the next frontier in mining. Yet much of the ocean remains unstudied, meaning we have no baseline for determining what harm such a disturbance might cause. As we near the first deep-sea mining expeditions — Australian-based Nautilus has the proper permits and could be working below the waves as soon as 2016 — scientists are scrambling to answer these questions before we no longer can. Ocean waters cover more than 70 percent of our Earth’s surface. Yet we’ve explored a mere droplet, according to NOAA. “For all of our reliance on the ocean, 95 percent of this realm remains unexplored, unseen by human eyes,” notes NOAA’s National Ocean Service. “The extent that we’ve covered is very, very small,” confirms marine biologist Christian Neumann. He’s part of the Deep Ocean Stewardship Initiative or DOSI, a multi-disciplinary group formed in 2013 aimed at making sure the right people are paying attention to the right issues surrounding deep-sea mining. DOSI and other projects like MIDAS (stands for Managing Impacts of Deep-seA reSource exploitation) have much work to do, because of the staggering amount we still don’t know. We do know, however, that great potential sits on, and below, the seabed floor. “There are certainly rich deposits to be had in our deep oceans and now it is possible to reach them,” Maria Baker, project manager of the International Network for Scientific Investigations of Deep-Sea Ecosystems (INDEEP) told weather.com by e-mail. The three types of deep-sea mining are worth describing briefly. The first, seafloor massive sulfides (SMS), are caused by hydrothermal fluids on or below the seafloor along the oceanic plate boundaries. “That’s the type of deposit off Papua New Guinea,” Phil Weaver of MIDAS told weather.com, and that’s where Nautilus plans to mine. The largest known SMS deposit is a 94-million-ton expanse of dry ore containing gold, silver, copper and zinc in the Red Sea. Cobalt-rich crusts, another type of mining, are deposits full of cobalt and other metals found on the seafloor, typically on seamounts, and are typically irregularly contoured. Despite the abundance of these crusts — one ISA estimate says they cover nearly 2 percent of the entire ocean floor — Weaver predicts this mining is the furthest off. So while mining of our ocean deep isn’t happening this month or next, it will happen in the near future. “It’s coming,” Neumann said. “But it’s not tomorrow, and it’s not the day after tomorrow.” That gives us time to ask — and hopefully answer — some important questions. Like: who owns the ocean floor, and how do we both explore deep-sea resources and care for the ecosystems that house them? There’s still time, but we need to act now, she added. “We are certainly running out of time.” As the mining industry moves forward, the environmental stewards can’t afford to stand still. Editor’s Note: An earlier version of this article listed Nautilus as Toronto-based. For years scientists have theorised about the amount of water locked in the Earth’s infernally hot depths, frustrated at not being able to get at a sample. Now geologists claim to be closer to an answer – thanks to a single ugly diamond found in Brazil. The brownish gem – bought for about $20 but of inestimable scientific value – has given researchers the first ever terrestrial sample of a rare mineral known as ringwoodite – the highest pressure high-pressure polymorph of olivine currently known to exist. Olivine – a green magnesium iron silicate – has been predicted to exist in its high-pressure gemstone form, peridot in the transition zone. Ringwoodite, the highest pressure peridot, has previously been found in meteorites, but has never been discovered on Earth before because scientists can’t reach the planet’s core. The Brazilian “diamond” was found on the surface in 2008 after being brought to the top by a volcanic rock known as kimberlite. When Pearson and his team bought the sample, they were actually looking for another mineral and stumbled on the ringwoodite by accident. Drop a message-in-a-bottle into the Gulf of Mexico, somewhere near New Orleans, and, 10 years later, your missive has a high likelihood of ending up near Cuba — or northern France. The website Adrift uses data from a global system of floating buoys to show you how ocean currents carry things like plastic debris around the planet. Marine archaeologists report they have uncovered new secrets of an ancient Roman shipwreck famed for yielding an amazingly sophisticated astronomical calculator. An international survey team says the ship is twice as long as originally thought and contains many more calcified objects amid the ship’s lost cargo that hint at new discoveries. At the Archaeological Institute of America meeting Friday in Seattle, marine archaeologist Brendan Foley of the Woods Hole (Mass.) Oceanographic Institution, will report on the first survey of Greece’s famed Antikythera island shipwreck since 1976. The ancient Roman shipwreck was lost off the Greek coast around 67 BC,filled with statues and the famed astronomical clock. Completed in October by a small team of divers, the survey traversed the island and the wreck site, perched on a steep undersea slope some 150 to 230 feet deep in the Mediterranean Sea. The October survey shows the ship was more than 160 feet long, twice as long as expected. Salvaged by the Greek navy and skin divers in 1901, its stern perched too deep for its original skin-diver discoverers to find. The wreck is best known for yielding a bronze astronomical calculator, the “Antikythera Mechanism” widely seen as the most complex device known from antiquity, along with dozens of marble and bronze statues. The mechanism apparently used 37 gear wheels, a technology reinvented a millennium later, to create a lunar calendar and predict the motion of the planets, which was important knowledge for casting horoscopes and planning festivals in the superstitious ancient world. A lead anchor recovered in a stowed position in the new survey shows that the ship likely sank unexpectedly when “a storm blew it against an underwater cliff,” says marine archaeologist Theotokis Theodoulou of Greece’s Ephorate (Department) of Underwater Antiquities. “It seems to have settled facing backwards with its stern (rear) at the deepest point,” he says. Scholars have long debated whether the ship held the plunder of a Roman general returning loot from Greece in the era when the Roman Republic was seizing the reins of the Mediterranean world, or merely luxury goods meant for the newly built villas of the Roman elite. The last survey of the shipwreck was led by undersea explorer Jacques Cousteau, whose documentary Diving for Roman Plunder chronicled that 1976 effort, which appears to have excavated the ship’s kitchen. The October survey team watched the 1970s documentary to help orient themselves to the wreck site. “They didn’t have the diving technology that we now have to do a very efficient survey,” Theodoulou says. Along with vase-like amphora vessels, pottery shards and roof tiles, Foley says, the wreck also appears to have “dozens” of calcified objects resembling compacted boulders made out of hardened sand resting atop the amphorae on the sea bottom. Those boulders resemble the Antikythera mechanism before its recovery and restoration. In 2006, an X-ray tomography team reported that the mechanism contained at least 30 hand-cut bronze gears re-creating astronomical cycles useful in horoscopes and timing of the Olympic Games in the ancient world, the most elaborate mechanical device known from antiquity until the Middle Ages. “The (objects) may just be collections of bronze nails, but we won’t know until someone takes a look at them,” Foley says. The survey effort, headed by Aggeliki Simossi of the Ephorate of Underwater Antiquities,will continue for the next two years. The international survey team will look in two different locales for ancient shipwrecks in that time, while Greek antiquities officials ponder further exploration. An amphora recovered from the wreck will also have its inner walls tested for DNA traces of the regular cargo, such as wine, once carried by the vessel. Recovery of whatever cargo remains with the wreck, now covered in sand, presents a technically difficult, but not impossible, challenge for marine archaeologists. “Obviously there are a lot of artifacts still down there, but we will need to be very careful about our next steps. This ship was not a normal one,” Theodoulou says. The dugout canoe does not know the depth of the water” (Umubindi ushira uvimye). So say the Hangaza, a group of more than 150,000 people who live along Lake Victoria, west of Tanzania’s Serengeti National Park. The proverb rings true: floating on the water won’t tell you what is going on below. Half a world away from Tanzania, along the United States West Coast, oceanographers are finding new ways of looking beneath research vessels that ply the Pacific. They’re getting a fish’s eye view of the deep by placing electronic tags on predators such as blue whales and California sea lions, yellowfin tuna and white sharks. As the data come in, their thoughts turn to the Serengeti. The eastern Pacific leatherbacks have a different migration pattern, traveling south from nesting sites in Mexico and Costa Rica to the southeast Pacific. The turtles feed in offshore upwelling areas where their meals, almost exclusively jellyfish, are easy catches. “The limited feeding grounds of the east Pacific turtles make them vulnerable to changes that might occur in the abundance of jellyfish,” says Bailey. “Being caught in fishing gear also poses a greater risk to this population because it has a smaller range than western Pacific leatherbacks.” Entanglement in fishing gear is believed to be a major cause of death in leatherback sea turtles. James R. Spotila of Drexel University, a coauthor of the paper, notes that leatherback turtles are long-lived animals that take a long time to reach maturity. Because the species’ numbers are declining very fast, he considers it critical to take measures so they don’t go extinct. In the past thirty years, leatherback numbers in the eastern Pacific have dropped by 90 percent. Information on the turtles’ movements will help scientists determine where fishing should be limited at certain times of the year, says Bailey. A good precedent is a decision made in 2010 to close a swordfish and thresher shark fishery off California from mid-August to mid-November. That may have dramatically reduced incidental leatherback catches. Which is where MBARI’s remotely operated vehicles (ROVs) Tiburon and Doc Ricketts, come in. 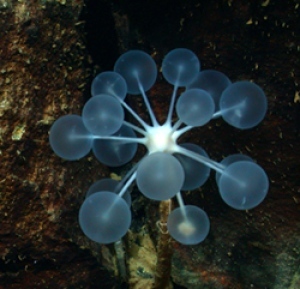 Using these deep-diving vessels, a team of researcher s led by Senior Research Technician Lonny Lundsten discovered a species of harp sponge called Chondrocladia lyra off the coast of California, at depths of 3316–3399m. 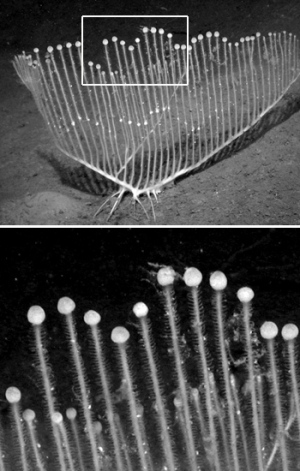 The vertical branches of the harp sponge are tipped by swollen terminal balls containing packets of sperm. Weird underwater discoveries such as an egg-eating Australian sea serpent and a strikingly coloured worm named after Star Wars‘ Yoda could carry on for decades to come, with new research estimating that up to one third of species remain undiscovered. A study co-led by a University of Auckland expert and published today in international journal Current Biology calculated there were fewer than one million marine species on the planet, lower than some previous estimates. The number undiscovered likely amounts to a third of all species. Hot spots for new finds included deep sea ecosystems and those in tropical areas, said Associate Professor Mark Costello from the University of Auckland, who co-led the research with Ward Appeltans of Flanders Marine Institute and the Intergovernmental Oceanographic Commission of Unesco. “If we look at the number of undescribed species and samples from around the world, especially deep sea and tropical areas, the average over 100 studies was that about 30 per cent of those new species were new to science,” he told the Herald. Easier identification, better technology and more scientists would boost the rate of discovery. Bizarre species discovered within the past year included Yoda purpurata, which had features resembling the Jedi master’s large sagging ears, a crimson shrimp found at a depth of 2600m beneath the Norwegian Sea, and an odd-looking bristle worm discovered 1600m below the northeast Pacific. “Knowing how many species there are in our oceans, and describing them, is vital for science and conservation for several reasons,” Professor Costello said. “Species are the most practical measure for distinguishing habitats and tracking progress in exploring the earth’s biodiversity. “They are as fundamental to biology as elements are to chemistry and particles to physics. Better understanding of what species exist enabled more accurate estimates of extinction rates through habitat loss, while having a “master list” of species’ names was essential for quality assurance. Research efforts have been boosted by the World Register of Marine Species – an open-access, online database that has received contributions from almost 300 scientists from 32 countries. The study supports previous research by Professor Costello and colleagues, which used statistical modelling and an earlier version of the register to reach a similar estimate of the number of species on earth and in the oceans. It is also the culmination of 14 years’ work for Professor Costello, who began a European register of marine species in 1997 that expanded until the world register was initiated in 2006. Around 226,000 species have been described by science and as many as 72,000 more are in collections awaiting description – yet hundreds of thousands more may still be waiting for discovery in our oceans. The rate of discovery is, however, increasing, with an unprecedented 20,000 new marine species described in the past decade alone, suggesting that most marine species will be discovered this century. Earlier estimates of ocean diversity had relied on expert polls based on extrapolations from past rates of species descriptions and other measures. Those estimates varied widely, suffering because there was no global catalogue of marine species, and a new study gauging a more accurate figure canvassed 120 of the world’s top experts on the taxonomy, or classification, of marine species. Mammals, birds, reptiles, insects and larger plants were some of the best-described groups of marine species to date. Many of the species yet to be discovered will come from among the smaller crustaceans, molluscs, algae, worms, and sponges. During most of August, Ballard’s research team on board the EV Nautilus have concentrated on the unique geological makeup of the Eratosthenes Seamount, one of the largest features on the eastern Mediterranean seafloor. The remains of the Ottoman war galley were found along with a flintlock pistol and what appeared to be black rum bottles littering the sea floor. Surprisingly, the metal pistol seemed to be remarkably well-preserved, but most of the wood from the ship has deteriorated having been eaten away by marine organisms. Ballard found global fame in 1985 after discovering the Titanic some three miles below the surface of the Atlantic. This discovery gave the world its first glance at the ghostly ship that sank in April 1912 after hitting an iceberg. His crew for the Cyprus expedition includes researchers, geologists and the renowned NASA astronaut, Cady Coleman, who is working as their navigator. She says that the earth’s oceans, much like deep space, remain a largely unexplored frontier. For those onshore, the expedition brought a once-in-a-lifetime adventure, as cameras beamed live, high definition pictures from the bottom of the Mediterranean sea to the internet. Katy Croff Bell, chief scientist of the Nautilus Exploration Programme, says that many viewers to the web stream were able to delve into the oceans’ secrets. Viewers witnessed a huge shark crossing the ship’s path with other highlights – including live pictures of mating squid and fossilized whale bones. Bell says one of the most important results of their exploration was the use of a so-called tele-presence, which means experts were on-call day-and-night to assist the team onboard when discoveries were made. “In every case, we were able to contact specialists who provided their expertise on how to proceed with studying the amazing discoveries that we have made in Cypriot waters,” she says. For Robert Ballard, the most fascinating aspect of the expedition was the in-depth probe of the Eratosthenes Seamount, which measures 120 km long and 80 km wide. Its peak lies at the depth of 690 meters and it rises 2000 meters above the surrounding seafloor.